Initially, all civilizations are the same, but the choices you make will swiftly differentiate yours from the others. It is up to you to decide if you will make your mark by encouraging the arts, by plundering weaker rivals, or by building fast food franchises. At the end of the game, the player with the most culture points wins. In Through the Ages, there is no map. You build your civilization on the table in the space in front of you. This space is called your player area. Read here all detailed information about the player areas. Set up the game boards in the center of the table in any configuration that makes it easy for everyone to see them. Read here all detailed information about the common areas. Randomly determine the starting player. The starting player does not change during the game and has no special role. However, to ensure that everyone gets the same number of turns, it is important to remember who the starting player was. If you like, you can mark the starting player by sliding one of the unused Age A military cards partially under that player's board. The game begins in Antiquity, which serves as a preparatory round for the rest of the game. In the first round, players have just a few civil actions. They take cards from the card row to shape the way their civilizations will initially grow. 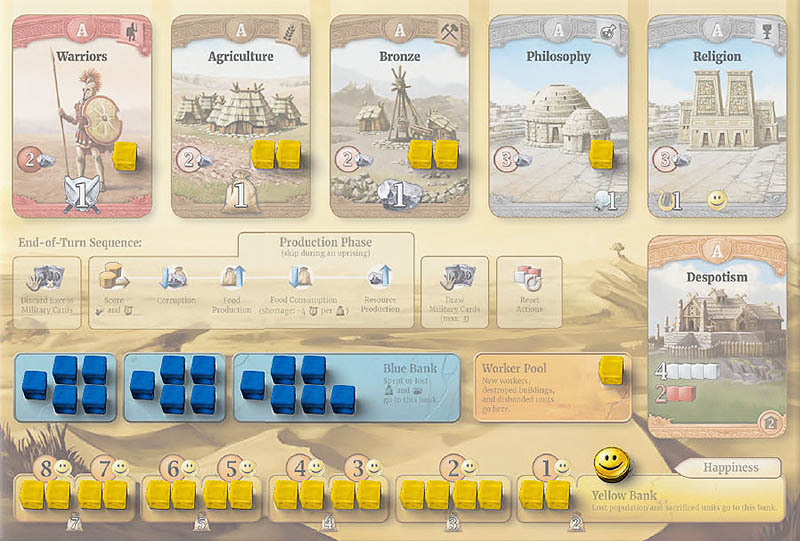 Each player's turn ends with production of science, food, and resources. Read here all detailed information about the first round. From the second round on, a few new civil cards appear in the card row at the beginning of each player's turn. The Middle Ages begin in the second round, and Age I cards appear in the card row. Read here all detailed information about the second round. From the third round on, players will have military cards. These allow players to plot political maneuvers and improve their military forces with tactics. Of course, players continue to work on increasing their population, developing new technologies, and expanding their production of food, resources, science, and culture. They will take steps to ensure their people remain happy, and they may also need to deal with corruption. Read here all detailed information about the subsequent rounds. When the Age I civil cards run out, Age II, the Age of Exploration, begins. Certain antiquated cards are discarded, and populations become more demanding, but otherwise, the game continues under the same rules. 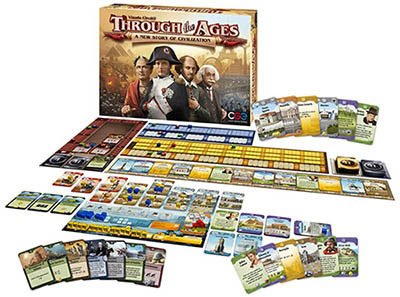 Age II civil and military cards enter the game, bringing advanced technologies, industrial wonders, and enlightened leaders. Your first game is shortened. When the Age II civil deck runs out, the game is near its end. Again, certain antiquated cards are discarded and the demands of your population increase. Age III, The Modern Era, begins, but you do not use Age III cards. 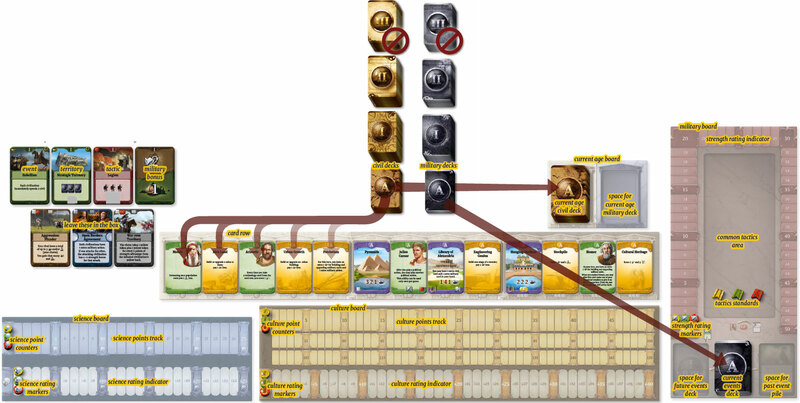 Each player is granted at least one more turn to put the finishing touches on a glorious civilization. The player to the right of the starting player will take the final turn, so that everyone will finish with the same number of turns. The player with the most culture points wins. Read The First Round, and play the first round of the game. Read The Second Round, and play the second round of the game. Read Subsequent Rounds, and continue playing. After the Age I civil deck runs out, read End of an Age below. At that time, you should also read End of the Game below so you know what to concentrate on during Age II. The old age comes to an end and the new age begins, bringing new opportunities for your glorious civilization. Age A ended immediately when the starting player replenished the card row for the first time. You placed the Age I civil deck and the Age I military deck on the current age board. They became the current decks. Nothing more happened at the end of Age A. When the Age I civil deck runs out, Age I ends. This can happen on any player's turn, while he or she is replenishing the card row. When the civil deck runs out, the illustration on the board is revealed. It reminds you of the steps at the end of an age. The steps apply to all players. This means that if the Age I deck runs out, Age A cards become antiquated. Players discard all antiquated cards from their hands. Anyone who still has an Age A leader must remove the leader from play. Anyone with an unfinished Age A wonder must remove it from play. (Any blue tokens on it are returned to that player's blue bank). The illustration also reminds you to remove antiquated pacts, but you do not have pacts in your first game. All other cards, including completed wonders, remain in play, regardless of their age. Finally, all players return two yellow tokens from their yellow banks to the box. This represents the fact that your population becomes more demanding as you advance through the ages. Advanced civilizations expect more bread and circuses. Tip: Plan ahead for the end of the age. Civilizations that ignore food production or happy faces will be in serious trouble. Age I has now ended and Age II begins. Shuffle the Age II civil deck and put it on the current age board. It is now the current age civil deck. If the card row was not fully replenished when the old deck ran out, fill in the empty spaces with Age II cards. Remove the Age I military deck from the current age board. Shuffle the Age II military deck and put it in place. It is now the current age military deck. Note: Cards in the current and future events decks are not affected by the end of an age. Players discard all Age I cards from their hands. Remove Age I leaders and Age I unfinished wonders from play. Each player loses 2 yellow tokens. Age II ends and Age III begins. In your first game, there are no Age III cards, so you remove the Age II military deck and leave the current age board empty. From now on, no new cards will be dealt to the card row. Players still remove cards and slide the remaining cards to the left, but the spaces on the right will stay empty. No one may draw any more military cards. After Age II ends, each player should have at least one more turn. It depends on who was the first player at the beginning of the game. If Age II ends during the first player's turn, this round is the last round of the game. Otherwise, you finish this round and the next round will be the last round of the game. In either case, the player to the right of the starting player will play the last turn of the game, so everyone will finish after the same number of turns. Your yellow bank holds yellow tokens. Some cards and effects may alter your number of yellow tokens. You take yellow tokens from the box or return them to the box in these special cases. You also return two yellow tokens to the box at the ends of Ages I and II (and Age III in the full game). A yellow token outside your yellow bank is a worker. See Summary - Workers on page 14. To turn a token in your yellow bank into a worker, you perform the "increase population" action. The food cost is given by the white number underneath the section from which you take the worker. It goes to your worker pool. Workers return to your yellow bank only when you sacrifice units for colonization, or when an effect requires you to decrease your population. Yellow tokens in your yellow bank are not workers. They are part of a bookkeeping system. The yellow bank is emptied from the right. When a section is emptied, a red negative number is revealed. This is your civilization's consumption. Consumption has no effect until your Production Phase. During the consumption step, you must pay that much food. If you _ fall short, you must pay 4 Igj for each missing A. Above each subsection is a number with a happy face. If a subsection is empty, your civilization needs that many happy faces. If you have fewer, the number of empty subsections to the left of the happiness marker is your number of discontent workers. Civil cards are discarded face up. Civil cards that are discarded or removed from play will never enter the game again. You can return them to the box. Military cards are discarded face down. Played and discarded military cards are sorted by their backs. If the military deck for the current age runs out, the discarded cards of that age are shuffled to form a new deck. Non-territory events are put on the past events pile after they are evaluated. They will not enter the game again. The game ends when the last player (the player to the right of the starting player) finishes his or her last turn. Then it is time for final scoring. Score 1 culture for each of your Age I technologies and 2 culture for each of your Age II technologies. Your government counts twice. Score culture equal to your science rating. Score culture equal to your strength rating. Score culture equal to your happiness rating. Score culture equal to your food and resource production. (Count up how much food and resources your workers produce during your production phase. Ignore corruption and consumption). Score 3 culture for each of your colonies. Score 6 culture for each of your completed Age II wonders. Go through the scoring list step by step, giving each player a chance to count up the corresponding number of points. Note: This list applies only to your first game. The full game has a different end- of-game scoring system. The player with the most culture points wins. In case of a tie, all tied players share the victory. 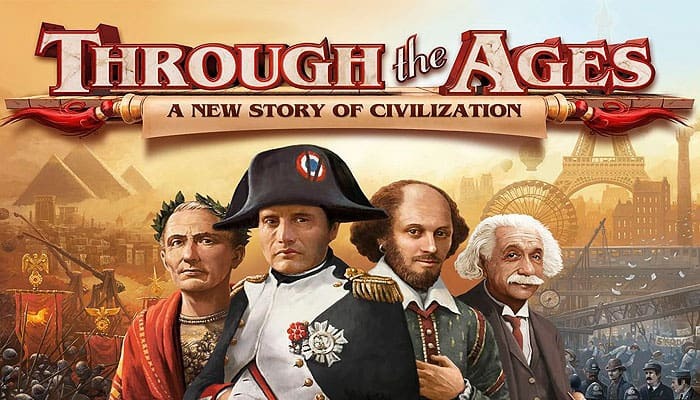 The full game will be like your first game, but with new cards to discover in Age III and more opportunities to interact with rival civilizations. Read here all detailed information about the full game.